Networks to harness social media buzz? 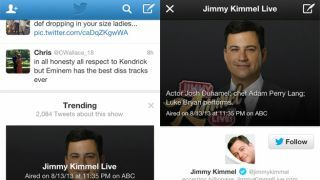 Twitter may be preparing to introduce a new feature that would see currently-trending television shows appear prominently within the timelines of users. According to reports, the 'Trending TV' experiment is currently being tested on a small percentage of iOS app users who are seeing a show-specific box at the top of their timelines when they refresh their feeds. In screenshots sent to TechCrunch, it looks as if the box links to a page dedicated to that show. It features the show's official twitter account and a live stream of related tweets from others. For example, if users were to see a Breaking Bad Trending TV box, they'd be able to click through to the @BreakingBad_AMC account and join the conversation with other viewers as the show is aired. In its essence, the proposition seems quite similar to second-screen apps like GetGlue and Zeebox that already use Twitter data to generate virtual chat rooms where viewers discuss ongoing shows. "Once you refresh, the trending box shows up," Twitter user ASG, who apparently is part of the test, told TechCrunch. "However, when you start scrolling the box flows down with your timeline. Over time, or when an insane number of tweets come out about the show, the box goes back to the top." The initiative would surely be a winning combination for potential advertisers that are seeking to cash in on the social media buzz surrounding popular programming. Not only would it give these firms the chance to alert viewers who may not be aware the show is being aired, hence the potential for improved ratings, but also gives official network accounts more visibility. Of the many prospective features Twitter lab tests on small samples of users, this is one that's probably more likely than not to see the light of day. Are you a VIP? If so, Facebook may have an app for you.